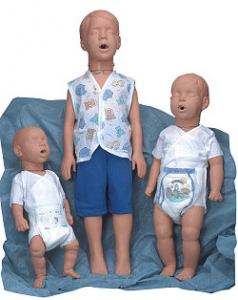 The Child Kyle Manikin provides effective child CPR training. This CPR training manikin weights approximately 10 lbs and includes 1 child manikin, soft carrying case, and 3 airways and mouthpieces (one set installed). Kyle child Manikin is a full-body 3-year old child.